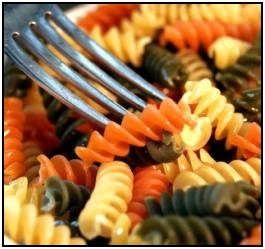 Carb loading is a great way to improve your sports performance. It's cheap, easy to do, and more helpful than most of the weird supplements out there that're supposed to improve your performance. On the most basic level, it just means eating a ton of carbs before your workout, game, or practice. Pasta, bread, rice, oatmeal, fruits, vegetables, and even power bars work well. But there are a few finer points that will help you get the most from loading up on carbohydrates. Why do carb loading? For the power. The primary fuel source for your muscles is carbohydrates (in the from of glycogen). Thus, eating a lot of them makes sure you have enough energy for your workout - since your supply of carbohydrates is normally the limiting factor for your energy. If you don't have enough carbs, you'll run out of gas halfway through. Which will cause huge decreases in your performance. This is even more pronounced if you're doing something intense and relatively short. For longer activities (jogging for an hour, long term lap swimming, marathons, etc.) you get more energy from your body fat, and less from carbs. However, if you're doing an activity that requires really good flexibility, carbohydrate loading might not work out as well. See, for every gram of glycogen (carbs) stored in your muscles for fuel, you'll also store 3 grams of water! This is great if you want your muscles to be big and bulky… but not if you need to be able to do a perfect splits in gymnastics, or high kicks for martial arts. The type of carbs that you use is really up to you. Whatever makes yumm carb loading meals that you will eat! Kiwi, mango, bananas, and apples all taste great, but in a pinch a sports energy bar will work fine. I prefer the brands Tiger's Milk and Balance myself, since they're small (easy to carry around) and taste good. Handy Tip: You might want to avoid fructose, the sugar (simple carbohydrate) that occurs in fruits. This gives some people gastrointestinal trouble. So, try with fruit and without fruit and see which works better for you. If you're going for a more endurance style event you could benefit from high glycemic index food, since it releases it's energy more slowly. But longer than 30 minutes and your body will be drawing a significant amount of its energy from your body fat, not carbohydrates. Even with carb loading, your muscles are depleted of glycogen fairly quickly during intense exercise. Thus, if you're doing something that's takes a lot of energy drinking sports drinks will boost your performance. Carbohydrate loading is deceptively simple. Just eat a high carbohydrate meal (at least 200 - 300 calories, and preferably more) about 90 minutes before your event.7 This will saturate your muscles with the glycogen that they need. You might wolf down a few power bars, rice balls, rolls, or just bring some apples and bananas to nosh on. Just make sure to give yourself time to digest them before you start actually moving around. Also, try eaten this way a few times before you do carb loading for a meet or competition. Make sure you know how your body will feel, whether you should eat a bigger/smaller meal than normal, etc. Get all the quirks worked out before you battle test it. As always, be sure to hydrate well before whatever you're doing. Tapering down your level of physical activity during the 7 days preceding your event - so you're rested and firing on all cylinders for that event. Increasing the ratio of carbs that you eat leading up to your event. If you follow these 2 directions, you'll be well rested and your muscles will have all the glycogen they need. The best of both worlds - but it takes a little planning. Note: Since you're eating so frequently, make sure your meals are smaller than normal. Otherwise, you'll be eating way too much food to use productively, and the extra will become fat. So, go out there and load up on your carbs! • Click here to get more of The Best Muscle Building Supplement Info! • Click here to leave 'Carb Loading to Improve Your Performance' & go back to the Home-page! 1. Benardot, Dan, and Dan Benardot. 2006. Advanced Sports Nutrition. Champaign, IL: Human Kinetics. Pp. 105.